This conference paper was originally published as Jones, SC, An Unhealthy Co-Dependence: The Relationship between Alcohol Sponsorship and Cricket in Australia, Proceedings of the Australian and New Zealand Marketing Academy (ANZMAC) Conference, 2007, 1509-1516. The Advertising Standards Board passes judgments on complaints each year against what is referred to as prevailing community standards. There is however, no explicit definition of what these prevailing community standards are. This research found that there were two major issues that were of most concern to the public in regard to (un)acceptable advertising: the portrayal of women and the consequences of social marketing advertisements. Neither of these issues are adequately addressed by the current advertising Code of Ethics. 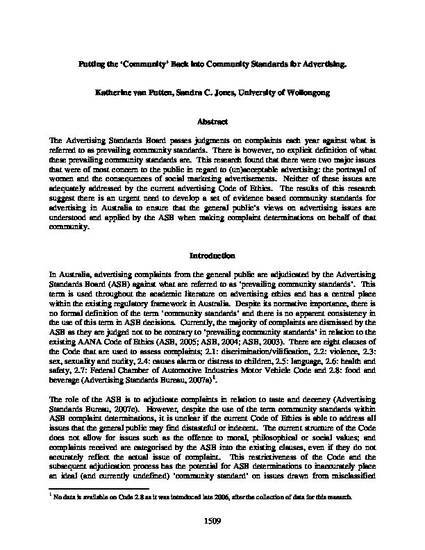 The results of this research suggest there is an urgent need to develop a set of evidence based community standards for advertising in Australia to ensure that the general public’s views on advertising issues are understood and applied by the ASB when making complaint determinations on behalf of that community.